Today I am joining bloggers and small shop owners across the country for Cookies and Crafts for Sandy Hook. The idea originated as a way for those of us in the blogging community to show our support to the grieving families of Newtown and to honor the innocent lives lost just one week ago today. At the bottom of this post, you will find links to other bloggers' posts who are sharing a cookie or craft in memory of the 26 lives lost at Sandy Hook Elementary. 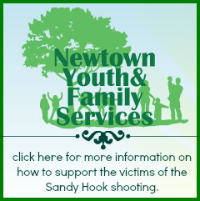 You will also find links to small shop owners' sites who are donating proceeds from their sales today and/or this coming weekend to the Newtown Youth & Family Services. I encourage each of you to visit the Newtown Youth & Family Services Donation Page to make a contribution today no matter how small. Every little bit helps. If your pockets are not as deep as you wish, please see my post from yesterday, Just One Thing for Sandy Hook projects/movements that only require a little effort, love, and perhaps a quick trip to the post office from you. Gingerbread cookies are one of my favorite cookies of the season. I love my gingerbread men thick, soft, and just slightly chewy. Last Christmas, I discovered The Brown Eyed Baker's Gingerbread Men Cookies recipe. It is the perfect gingerbread cookie recipe. In honor of the innocent lives lost at Sandy Hook, I wanted to make gingerbread angels instead of gingerbread men. I didn't have an angel cookie cutter so I improvised my using a gingerbread man cookie cutter and a butterfly sandwich cutter I had bought last spring. To make the angel wings, I cut the butterfly shape in half and then pressed the wings onto the back of the gingerbread man. Just make sure to press the unfloured side of the wing into the unfloured side of the gingerbread man. The floured side will not stick. I only had to increase the bake time by a couple of minutes since the cookies were a tad bit larger than a normal sized gingerbread man. I decorated each gingerbread angel with a green heart outlined in white for the Sandy Hook Elementary School colors. I also made a few stars to represent the teachers who lost their lives and also frosted them with a green and white heart. I wish that I could have made 20 gingerbread angels and 6 stars to represent all the lives lost that December morning, but the angels were pretty large. I shared the angels and stars with friends and family. These are the cutest little cookies!! I think the angels turned out great!! ohh these are SO CUTE!!! what a great idea! I linked up my snowflake post, thanks!!! Oh these are so cute Carrie!